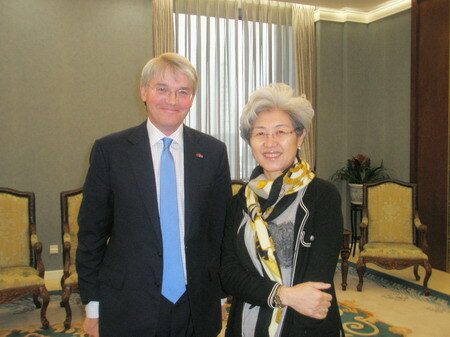 On November 29, 2011, Vice Foreign Minister Fu Ying met with and hosted a banquet for visiting British International Development Secretary Andrew Mitchell. The two sides mainly exchanged opinions on the bilateral cooperation and the issue of international development. Mitchell stressed that China has achieved tremendous results of poverty reduction and set a good example. China has rich experiences of cooperating with African countries and such cooperation is very productive. Britain attaches importance to cooperating with China in the international development affairs. Fu introduced some practices and principles of the Chinese side and noted that China expects to strengthen dialogue and cooperation with Britain on the issue of international development based on mutual respect and equal treatment. The two sides also exchanged opinions on how to view China's development and the China-Britain relations.